And now for Part 2 in our three part series. Here we want to focus on one of the many incredible sites Daisy of Daisy Saulls Photography captured on the day of our styled shoot at Mount Airy. As we took advantage of all the beautiful views and buildings on the property, we headed from the mansion to the stables. With an original chandelier taken from the entrance hall of the house, and a beautifully worn oriental rug, the stables didn't need much to really come alive for our shoot. Meggie and I brought in some of our vintage rental furniture, the beautiful Herend China, Waterford crystal, and handmade antique silver to set the table. We hung some vintage gilded frames on the wall and voila! The stage was set for a spectacular wedding celebration! Again, our flower inspiration came from what was currently in the gardens at Mount Airy, as well as the stationary artwork from Inslee of Inslee By Design. The garland on the table is an exact replica of her botanical drawings! (See our previous post for a picture of the stationary, with calligraphy by White House calligrapher, Pat Blair.) The cake was designed by Carolyn Taylor of Taylor Made Cakes, and we didn't have to add much to tie it into the flowers used throughout the space. 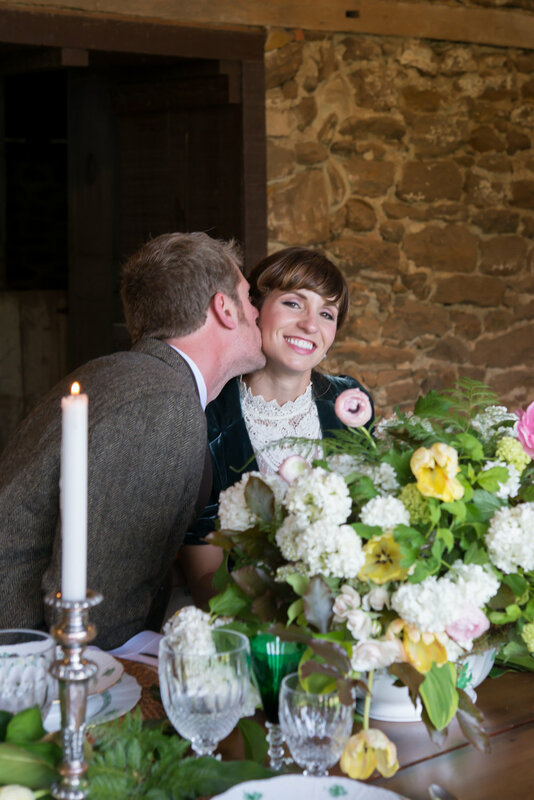 Daisy really captured some special moments between our real-life husband and wife team, Laura and Luke of LLB Design, LLC, showcasing Laura's beautiful hair and makeup, done by Michelle Viscal of Emeralds Salon. Our models' wardrobe was planned and executed by Daisy...great job on capturing that old world feel from early episodes of Downton Abbey! A big thanks to all who helped make this shoot possible, especially the owners of Mount Airy. Your home is a beautiful piece of history, and thanks to you, many will now have it be a lasting memory of their wedding day. Can't wait to share Part 3 with you! The hunt is on! This Dutch Baroque painting by Jan Davidsz. de Heem is stunning! It serves as such an inspiration as we move into Fall...dark and moody just in time for Halloween . We love playing with these rich textures and colors ourselves. Fall in love, as we have with this amazing inspirational photoshoot. We had the pleasure to collaborate with Daisy Sualls Photography on a beautiful shoot. Inspired by Downton Abbey’s Duck Hunting Episode during season three, we worked to create our own spin on site at Mt. Airy in Warsaw, VA. We can't wait to share more images this week of this wonderful day. A little TBT blog post. We have been so busy this spring with many fun projects. And here is one from last month where we had the pleasure of providing some beautiful flowers. This special event was for the Orange County Hunt and the party was held at a private farm near The Plains, Virginia. Not only did we provide the table centerpieces, but also a large statement piece for a coffee table. We loved working with the cheery, spring color palette while still incorporating the hunt's colors of red and white. As mentioned in my earlier post, Edible Flowers (Part 1) , Catherine's birthday was approaching and I wanted to create a flower themed present. While rummaging through a local thrift store I found the most adorable wooden recipe box that started my creative wheels spinning. All things that bloom are a huge inspiration to me right now. Not only because of our new floral business, but also because spring is finally here. I took the box with its great lines home, and painted it. Then the project was put on hold. I did not end up gifting it to Catherine for her birthday, but decided that it would make a wonderful Mother's Day present. Over the past couple of weeks, I have started the project back up. Additionally, I sourced some organic edible flower seeds, looked up some recipes that call for flowers and turned this whole idea into an edible flower themed gift! As I said before, the use of flowers in food create a huge impact, not only with their added visual beauty and enticing aromas, in a salad for instance, but also with their variety of flavors ranging from spicy to sweet. That being said it is crucial to know which ones are safe to eat. When selecting flowers for consumption it is important to make sure they are non-toxic and not poisonous. Here's to many delicious spring flowers! Happy Mother's Day! We have eagerly been waiting for spring to arrive here in Virginia and it looks like it finally has come. Not only for the much appreciated warmer weather to turn our grey landscape green, but so that we can put together images to showcase some of the vintage and antique pieces we are offering as rentals. We look forward to having our inventory up online soon. This will be a great resource, not only for event planners looking to stage the perfect party, but also photographers looking for hard to find, unique props to stylize shoots.